Purdy High School's golf program is no stranger to success and neither is Zoe Brown. Brown finished in third place at the sectional tournament, awarding her the opportunity to compete in the state championship tournament. Even through rain-delays, Brown was able to swing her way to the fifth place spot at the tournament, where she finished in the competition. Other accolades in Brown's golf bag this season is a second place finish in districts, first place in the Strafford Tournament, second place in the Purdy Lady Eagles Golf Tournament with a first place team finish, and a fifth place finish in the Cardinal Invitation Tournament after a third place "score card playoff." Brown is the daughter of Travis and Jennifer Brown of Purdy. 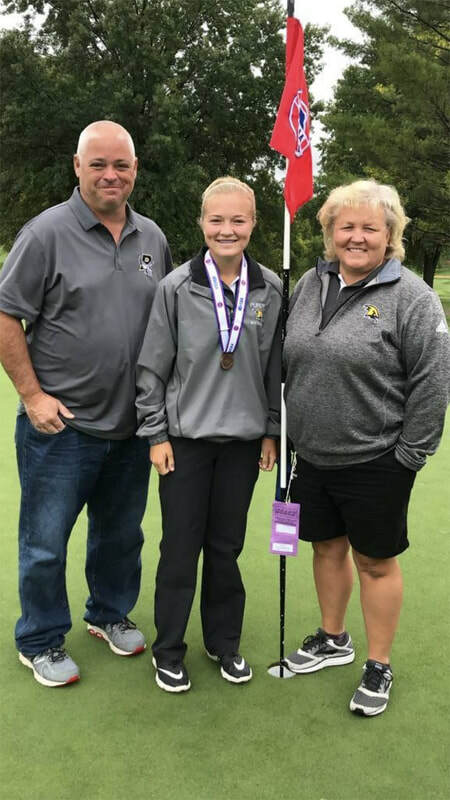 She is pictured with her coaches Doug Nickle and Lori Videmschek.